Kenny Sharretts - How to tune a 8" Tom Drum to Sound Great. Hello everyone. Here's a tip for making 8" toms rock. While I am an aficionado of using a fourth interval from top head (tonic) to bottom head( perfect 4th above) this tuning can make an 8" Tom sound a bit bongo like at higher tensions. To avoid this, I tune the 8" Tom to a minor 3rd interval from top head (tonic) to bottom head (minor 3rd above). Not only does this warm up the sound of the drum, but it adds a natural bend down in pitch. A drop if you will. It adds an ingratiating leading quality to the start of a big Tom fill. This interval also well on floor toms when you that little bit of whang, but do not want to sacrifice the quality of the sound hitting the mic. 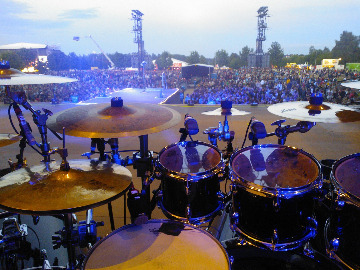 If you like my tech tips, please like my Kenny Sharretts Drum Page on Facebook.